Sporting Kansas City continue to make some early season changes to their roster. Today the team waived Haitian defender, Mechack Jerome. Jerome had appeared in three games so far this season, two league games and the team's game in Cruz Azul in the Champions League. He'd appeared in another 10 games last year in MLS play for Sporting after signing with the team in preseason last year. This year though Jerome looked to have lost his place as the primary reserve right back to home grown player, Kevin Ellis. As in the absence of starting right back, Chance Myers, Ellis has started all but one game there this season. The move opens up a third roster spot for Sporting KC at this time. When the team waived Josh Gardner, the releases said that KC was looking at two defenders and a midfielder. The team appeared to let the cat out of the bag on Brazilian right back, Igor Julião, when he appeared on the roster page of Sporting's app. That would leave KC with two open spots. Another player, could be DC United's second round draft pick, Victor Muñoz, who posted on Twitter that he was headed to KC after leaving DC, although that could just as easily be a trial. Either way, I'd expect moves soon. After allowing two goals in stoppage time this season, Sporting KC reversed their fortunes on Saturday in Colorado, getting a winner from Dom Dwyer in stoppage time to give KC a 3-2 win over the Colorado Rapids. The two teams traded blows throughout the second half that saw KC grab the lead before two PKs by the Rapids (their fourth and fifth of the season) put them on top. Only a minute after they went up though KC was level before the Dwyer winner. The first half of the game though lacked the appeal the second half gave, although there were some opportunities for each team. The first really good look came for KC in the 18th minute as a Matt Besler throw in was met by Ike Opara around the penalty spot, but Opara's header went just wide of the post. The Rapids came back down the field and had their own opportunity as Drew Moor put a free header over the bar to keep it 0-0. Colorado again in the 22nd should have taken the lead as Vicente Sanchez raced down the wing before getting Eric Kronberg to commit and laying a ball into the middle for Nick Labrocca. Labrocca though scuffed his shot and Matt Besler was able to clear it off the line. Colorado got themselves another good opportunity in the 29th after winning a free kick. Kronberg got caught with the ball at his feet as Sanchez came sliding in on the tackle. Sanchez did not get immediately back up and with his legs around Kronberg, KC's goalkeeper couldn't move. In the end the referee called a foul on Kronberg and gave him a yellow, although I'm not sure how dangerous play wasn't called on Sanchez first as he tried to play the ball on the ground. Dillon Powers fired the shot on goal but Kronberg made the save and then covered the rebound. Kronberg again was called upon to make a good save after Edson Buddle raced at the KC defense and fired a shot on goal. Early in the second half, KC jumped out in front. After winning the ball at midfield, the ball came to Paulo Nagamura who played a great ball down the line to Sal Zizzo. After two Rapids players committed to the ball, Zizzo slid the ball across the face of goal to an unmarked Graham Zusi who tapped the ball home for a 1-0 lead. The Rapids almost equalized immediately as Kronberg was forced to make a save on a header off a free kick. Shortly after though the Rapids won their first penalty kick of the day. Sanchez fired in a shot from outside the box that Kronberg couldn't hold. The ball bounced over to the side of the goal where Jared Watts and Opara were. As Watts and Opara both went for the ball, Opara ended up getting hit in the shin by a cleat. Opara fell to the ground in pain, right on top of the ball and referee Jose Carlos Rivero called Opara for a hand ball. Opara ended up staying down and had to be subbed out. In the meantime, Sanchez stepped up and put the PK to Kronberg's right. The goalkeeper got a piece of it but couldn't keep it out. KC almost grabbed the lead back in the 68th off a Benny Feilhaber free kick, but he curled his effort just wide of the near post. The Rapids picked up the pressure and in the 77th minute won another penalty. Shane O'Neill nutmegged Feilhaber and dribbled into the box where Feilhaber committed a rash challenge and again a PK was awarded. Sanchez again went to Kronberg's right, but the KC goalkeeper had gone the opposite way and the Rapids led 2-1. The lead lasted less than a minute though as KC quickly struck the other direction. A cross by Zusi was headed back into the middle by Zizzo into the path of Feilhaber. Feilhaber missed on his first attempt but got back on his feet and knocked the ball into hte net to make it 2-2. In the 85th things got worse for the Rapids as Marvell Wynne picked up his second yellow card of the match for a tackle on Zusi which saw him sent off. With the man advantage, KC took control of the game. Dwyer just missed with a turning, curling shot off a throw in from Besler. KC took advantage of the man advantage in the second minute of stoppage time. Receiving the ball near the corner of the box, Dwyer dribbled towards goal on Moor. Getting a bit of space Dwyer let fly with a hard left footed strike that beat John Berner to give KC the lead 3-2 in stoppage time. KC controlled the last few minutes of stoppage time to walk out with all three points. Wizards Man of the Match - Graham Zusi - Involved in all three of the goals, scoring one and setting up the other two. If Zusi can round into form like Feilhaber has, KC will be very dangerous. Player Ratings: Kronberg 5, Ellis 5, Opara 5, Besler 5, Sinovic 5, Rosell 5, Nagamura 6, Feilhaber 6, Zusi 8, Bieler 4, Zizzo 7. Subs Collin 6, Olum 5, Dwyer 7. Over 700 Sporting KC fans are descending on Colorado tonight ahead of tomorrow's game against the Rapids. Sporting KC head into the game looking to pick up their first road points of the season. They dropped one point in their only other road game in stoppage time in Seattle on the opening weekend of the season. The Rapids head into the weekend having won their home opener last weekend, 2-0 over the Portland Timbers on a pair of penalties. Their other game this season was a 1-1 draw on the road against New York. Their three goals so far this season have all come from the penalty spot with Vicente Sanchez scoring two goals and DeShorn Brown with the other. The Rapids will be without a few contributors tomorrow due to injury or suspension. Chris Klute and Dillon Serna are both set to miss out due to injury, while midfielder, Jose Mari will miss out thanks to a red card picked up against Portland,. Sporting isn't fairing much better in the goal scoring department as neither of their league goals this season have come from the run of play, one corner kick and one PK. With KC's elimination from the CONCACAF Champions League you have to wonder if designated player, Claudio Bieler will get the start at center forward over Dom Dwyer tomorrow. Sporting has scored just a single goal with the Englishman on the field this season, so switching things up may not be the worst thing in the world. On other fronts, Chance Myers is still questionable with a groin issue, which looks to keep him out for another game. He's joined on the injury list by Soony Saad and CJ Sapong. That would leave KC with Jacob Peterson, Sal Zizzo, and Graham Zusi to fill the wing forward positions tomorrow for KC. Other than that, KC has finally gotten a bit of rest after having five games in 15 days to start the season. The rest should do the team good heading into the weekend. Key Match Up - Claudio Bieler/Dom Dwyer vs Marvell Wynne and Drew Moor - The Sporting offense needs to start finding their finishing boots. With that in mind it's probably time to throw Bieler out for a start in league play. I know based on my stats yesterday he's not the best defensively, but so far this year he's shown an increased tenacity on the field and has helped out defensively. But finding the back of the net is the main job for either him or Dwyer. Number to Remember - 841 - That's the number of away fans traveling to Colorado per Robb Heineman earlier today on Twitter. That's an incredibly number traveling eight and a half hours (by car). PREDICTION - Colorado has looked to be a good team so far this season, beating the Western Conference regular season champs at home and tying the Supporters' Shield winners on the road. They now face the MLS Cup champs at home. The Rapids will not be easy and even with the number of traveling KC fans there it's not going to be easy. The Rapids are a good young team that is going to cause KC a lot of issues, and I'm not sure KC's offense has woken up enough to get all 3 points. There's been a debate going on among Sporting KC fans for much of the last 6-9 months or so. That debate is who should be starting up top for Sporting KC in the center forward position. Since Dom Dwyer returned from his loan to Orlando City in June of last year he's started to get more and more of the game action. He started Sporting KC's stretch run in league play last year and started over KC's designated player, Claudio Bieler at MLS Cup. It was Bieler though that was on the field when KC scored against Salt Lake and who scored his PK in the shootout that helped KC win. This year the two have split time so far in the four games. While Dwyer has gotten the starts in all three of KC's league games, Bieler has gotten the two starts in the two Champions League games against Cruz Azul. But really who has been a better starter for KC? I took a look at some of KC's stats when Bieler and Dwyer are on the field. I started by looking at the main stat that forwards are judged on, goals. Bieler obviously scored more goals, but I decided to look further and see how many goals KC scored when both Bieler and Dwyer were on the field. The first thing that needs to be pointed out is that the two have never been on the field at the same time in a competitive game. The two spent time on the field together during preseason, but that hasn't carried over competitive play yet. One or the other has been on the field for all but 277 minutes of the 3,060 that KC played in league play last year. One of the two were on the field for 45 of KC's 47 league goals. The two they weren't on the field for was Graham Zusi against Colorado, and Lawrence Olum against Philadelphia. Second, Bieler played over three times the minutes that Dwyer did during the 2013 season (2,109 vs 674). When looking at the goals per game, there isn't a huge difference, when Bieler was on the field, KC averaged 1.54 goals per 90 minutes, while for Dwyer the team averaged 1.2. In all competitions, the gap closes, Bieler's goals per 90 minutes fell to 1.49 while Dwyer's rose to 1.42. When looking at the 2014 numbers included there's a large difference. Dwyer's numbers fall to under a goal every 90 minutes to .97, mainly due to the fact that KC has scored just one goal in his 257 minutes this season. Bieler's meanwhile increased to 1.57 as KC scored one goal in his 13 minutes of league play so far this season. In all competitions, Bieler still remains higher with 1.5 goals per 90 minutes while Dwyer is at 1.17 goals per 90 minutes. When I was sharing this information on Twitter the other day, I had someone ask about Kei Kamara's effect on the goals. The Sierra Leone international was Sporting's second leading scorer last season with seven goals, while only playing a third of the games. So it's a fair assumption to ask how his presence affected both player's goal scoring. Dwyer never started a game with Kamara, he only played 42 minutes with him. During that time though KC scored three goals in those limited minutes. Close to 50% of Bieler's minutes came with Kamara on the field, but so did half of the goals scored (18 of the 36 scored with him on the field). Without Kamara's minutes on the field, Dwyer's goals per 90 minutes dropped below one, to .85 per 90 minutes. Meanwhile, the scoring rate with Bieler stayed relatively the same, with 1.51 per 90 minutes. The next thing that I looked at was the scoring statistics home and away. When it came to home goals, I was quite surprised at the difference. With Bieler on the field for 1,144 minutes in league play last year and this year, KC is averaging 1.97 goals per 90 minutes. Meanwhile for Dwyer, KC is averaging over a goal less per 90 minutes, at .96. Away from home the stats were much closer, but Bieler still held the lead, with 1.1 goals per 90 minutes while Dwyer was at .98 per 90 minutes. Since we are Sporting KC though and we now that a key part of Peter Vermes' style is his high pressure and defending from the front I also took a look at KC's defensive record when the two forwards were on the field. The stats here most definitely favor Dwyer over Bieler. In league play last year, only four goals were scored while Dwyer was on the field, an average of .53 goals per 90 minutes. Meanwhile, Bieler's was quite a bit higher, at .94 per 90 minutes. Combine this year's league play, and the difference increases as Dwyer has fallen to .48 while Bieler is up to .98. In all competitions in 2013, both players numbers dropped further from last year with Dwyer at .47 and Bieler at .89. Factor in 2014, which includes the big loss in Mexico City and both player's numbers rise. Bieler goes to 1.01 goals per 90 minutes while Dwyer goes up to .51. Like above, I also took a look at KC's record home and away with the two. The difference between the two is comparable to the numbers for goals scored. While KC is scoring more at home (1.97 goals per 90 minutes) and away (1.1 goals per 90 minutes) with Bieler, their defensive record is worse (1.1 goals per 90 minutes at home, .82 goals per 90 minutes on the road). For Dwyer, his offense at home was worse (.96 goals per 90 minutes), his defensive record was excellent (.19 goals per 90 minutes). And on the road is difference was comparable to Bieler's (.97 for while .78 against). In the end it's a matter of what Vermes wants. KC seems to score more when Bieler is on the field, but with Dwyer on, KC's defense appears to be much more stout. With the way Vermes has liked to play I'm not totally surprised that as of late last year and early this year, Dwyer has gotten the majority of the minutes. But throughout preseason, and against Cruz Azul in KC, Bieler showed a lot more defensive bite and a better work rate that would seem to fall more in line with what Vermes wants out of his forwards. There are obviously a number of other factors that can be split out here, but I thought the break down for the two players was interesting. It'll be interesting to see how the minutes get divided up as the season goes, and if Vermes does end up trying to put them on the field together with Bieler playing behind Dwyer. Former SKC Wizards were busy this week as five former players scored in their games this past week. Will John, Milos Stojcev, Carlos Marinelli, Yann Songo'o, and Ivan Trujillo all found the back of the net for their club team. Here's the rest of this week's update. Davy Arnaud - DC - Started and played 66 minutes in DC's 1-0 loss to Toronto. Teal Bunbury - New England - Started and played 90 minutes in New England's 0-0 draw with Vancouver. Bobby Convey - New York - Came off the bench and played 7 minutes in New York's 1-1 draw with Chicago. Luis Gil - Salt Lake - Started and played 90 minutes in RSL's 1-1 draw with LA. Michael Harrington - Portland - Started and played 90 minutes in Portland's 2-0 loss to Colorado. Jack Jewsbury - Portland - Started and played 79 minutes in Portland's 2-0 loss to Colorado. Eddie Johnson - DC - Started and played 90 minutes in DC's 1-0 loss to Toronto. Chris Konopka - Toronto - Did not dress in Toronto's 1-0 win over DC. Rauwshan McKenzie - Portland - Did not dress in Portland's 2-0 loss to Colorado. Khari Stephenson - San Jose - Dressed but did not play in San Jose's 1-0 loss to KC. Tyson Wahl - Columbus - Dressed but did not play in Columbus' 2-1 win over Philadelphia. Christian Duke - Oklahoma City (Loan) - No game this week. Brian Fekete - Pittsburgh - No game this week. Jon Kempin - Oklahoma City (Loan) - No game this week. Mikey Lopez - Orlando (Loan) - Dressed but did not play in Orlando's 1-1 draw with Charleston. Kyle Miller - Oklahoma City - No game this week. Mike Reidy - Rochester - No game this week. Yomby William - Richmond - No game this week. John Wilson - Charleston - Started and played 90 minutes in Charleston's 1-1 draw with Orlando. Korede Aiyegbusi - Servette FC - Switzerland - Did not dress in Servette's 0-0 draw with Winterthur. Scott Angevine - Sporting Kristina - Finland - Season has not started. Vicente Arze - FK Hoverla Uzhhorod - Ukraine - Did not dress in Hoverla's 1-0 win over Karpaty. Federico Bessone - Millwall - England - Did not dress in Millwall's 2-1 loss to Leed's. Dressed but did not play in Millwall's 3-2 loss to Birmingham. Omar Bravo - Chivas - Mexico - Dressed but did not play in Chivas' 1-1 draw with Atlas. Mitchell Cardenas - Atlético Coatzacoalcos - Mexico - Beat UA Zacatecas 1-0. Sunil Chhetri - Bengaluru - India - Started and played 90 minutes in Bengaluru's 3-0 loss to Shillong Lajong. Eloy Colombano - UAI Urquiza - Argentina - Did not play in UAI's 2-1 win over Fenix. Daneil Cyrus - W Connection - Trinidad - Started and played 90 minutes in W Connection's 1-1 draw with North East Stars. Pablo Escobar - Cúcuta Deportivo - Colombia - Did not dress in Cucuta's 1-0 loss to Llaneros. Roger Espinoza - Wigan - England - Out injured. Herculez Gomez - Tijuana - Mexico - Came off the bench and played 16 minutes in Tijuana's 3-1 win over Puebla. Jeferson - Boavista - Brazil - Started and played 90 minutes in Boavista's 1-0 win over Bangu. Will John - AZAL - Azerbaijan - Started and played 90 minutes, scoring a goal in Azal's 2-1 loss to Baki. Kei Kamara - Middlesbrough - England - Started and played 88 minutes in Middlesbrough's 3-1 loss to QPR. Did not dress in Middlesbrough's 2-2 draw with Huddersfield Town. Igor Kostrov - FC Costuleni - Moldova - Beat Academia UTM 1-0. Carlos Marinelli - Universidad San Martin - Peru - Started and played 90 minutes, scoring a goal in San Martin's 1-0 win over Los Caimanes. Neven Markovic - Servette FC - Switzerland - Started and played 90 minutes in Servette's 0-0 draw with Winterthur. Yura Movsisyan - Spartak Moscow - Russia - Started and played 90 minutes in Spartak's 4-0 loss to Krasnodar. Michal Mravec - Podbeskidzie - Poland - Did not dress in Podbeskidzie's 1-1 draw with Cravovia Krakow. Pablo Punyed - Stjarnan - Iceland - Beat Selfoss 3-2 in the League Cup. Yann Songo'o - Ross County (Blackburn) - Scotland (England) - Started and played 90 minutes, scoring a goal in Ross County's 2-1 loss to Motherwell. Started and played 90 minutes in Ross County's 1-1 draw with Aberdeen. Milos Stojcev - FK Sarajevo - Bosnia - Started and played 90 minutes, scoring a goal in Sarajevo's 2-1 win over Velez. Dress 0-0 with Zeljeznicar in the Cup. Matt Taylor - Preußen Münster - Germany - Came off the bench and played 10 minutes in Munster's 2-0 loss to Jahn Regensburg. Ivan Trujillo - Deportivo Lara - Venezuela - Came off the bench playing 45 minutes, scoring two goals in Lara's 4-2 loss to Carabobo. The above screen shot is from the Sporting Club Uphoria app. It would appear to show the new player that Peter Vermes hinted at today that the club would be announcing in the next few days. The player, Igor Julião, had been linked with Kansas City earlier this month but it looks like the move will officially take place. 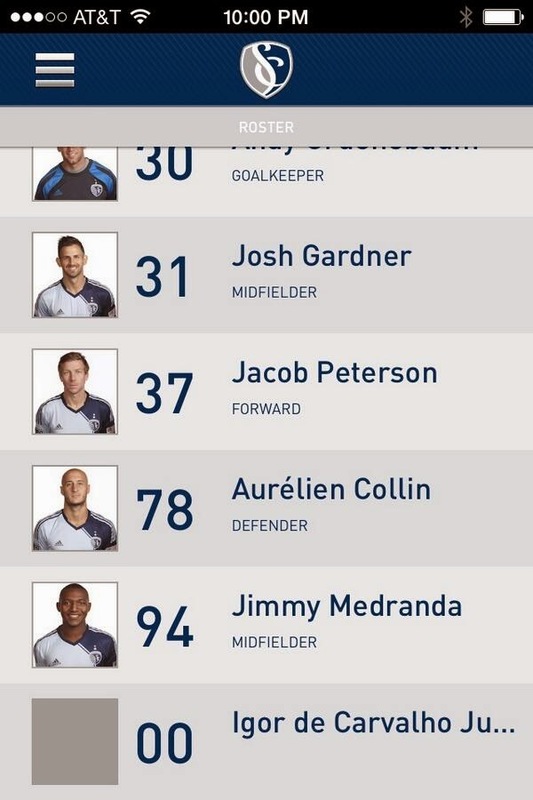 Julião's name had been on the app since at least Saturday's game against San Jose apparently. Sporting KC got an up close look at Julião in the Disney Pro Soccer Classic as he played with Fluminense's U-23 team during the tournament. He started the game against Kansas City that the Brazilian side lost 3-0 to SKC. The 19 year old has appeared for Fluminense's first team 20 times in 2013, starting 14 of those games. In his last game for the club, back in December, he was subbed out for the LA Galaxy's recent signing from the club, Samuel. He's mainly played as the club's right back, and did so in preseason as well for the U23 side. So he'd likely be competing with Kevin Ellis and Mechack Jerome to be Chance Myers' primary back up. It would also seem to open things up to one of those players going to Orlando as the team's second loanee to the USL-Pro affiliate. Sporting today announced that the club had waived defender, Josh Gardner along with placing Peterson Joseph on injured reserve. The two moves allow KC to free up two roster spots, leaving KC with one on budget spot (for players 1-20 on the roster) and one off budget spot (21-30). The timing of the moves is interesting, and already I've seen people ask about potential signings coming in to take that one on budget spot. The Gardner move is a little surprising, but not shocking. He's not gotten too many fans in KC from his performances in games like last year's US Open Cup loss to Orlando or against Cruz Azul in Mexico City when he was subbed out early with an injury. And with the recent emergence of Kevin Ellis and the signing of Toni Dovale, KC looks like they now have enough cover at the left back spot to make Gardner's spot expendable. He appeared in nine MLS games, three CCL games, and two Open Cup games, recording one assist in his KC career. Joseph going onto the injured reserve was much less surprising; in fact most people have been expecting it for a while. The Haitian international hasn't practiced since collapsing in practice late in the 2013 season. Since then he's had a number of tests done but the cause has still not been found. The only surprise is that it took KC this long for it to be officially mentioned that he was going on IR. In quotes about the waiving of Gardner, Peter Vermes has said that the move was done in order to make room for an international defender that they hope to announce this week. Could that be a reference to Brazilian right back, Igor Julião, who the club was linked with earlier this month? Graham Zusi made his 125th league appearance for KC, tying him with Tony Meola for 14th all time on that list. No team has won on the road in this series since 2004, a stretch of 18 games in all competitions. Sporting Kansas City finally got themselves off the mark with a win in MLS play tonight with a 1-0 win over the San Jose Earthquakes thanks to a second half PK goal by Dom Dwyer. As might be expected after the two teams played CONCACAF Champions League games on Wednesday, the game lacked a lot of the bite that you'd expect from the match up, but both sides had their chances to pick up the win. For the majority of the first half, Kansas City controlled the game. They did a good job of playing the ball around the field and had good movement, but their final ball was really lacking. KC had a really good chance in the 18th minute off a Seth Sinovic long throw. Ike Opara beat Jon Busch to the ball and flicked it toward goal, but Jean-Baptiste Pierazzi biked the ball off the line. The ball went to Sal Zizzo who fired a shot from outside the box that beat Busch, but hit off the post and bounced back into play where it hit off of Ike Opara. The deflection off of Opara bounced back off the post a second time. And with the goal open, Opara couldn't get enough of a touch on the ball to turn the ball in as it went out for a corner. KC continued the pressure and had another good opportunity in the 25th minute. After working the ball around the field, Kevin Ellis picked out Benny Feilhaber who dribbled into the box and squared the ball for Graham Zusi whose shot to the lower corner was well saved by Busch for a corner. As the half wore on KC also had a penalty shot as a cross went into the box for Zizzo who tried to touch it past Clarence Goodson, but ended up going down. No call was made though. KC continued to pressure in the second half and won a corner in the 55th. Zusi played it short to Sinovic who played it back to Zusi. His cross into the box was headed towards goal by Opara, but Busch tipped it over the bar for another corner. Off that corner, San Jose cleared the initial corner, but the ball got played back into the box and in the mix of bodies in the box shouts for a hand ball went up from a number of KC players. Referee Ricardo Salazar agreed, pointing to the spot. Replays showed that Steven Lenhart appeared to bat the ball away from Opara and Aurelien Collin during the play. Dom Dwyer stepped up and sent Busch the wrong way making the score 1-0. The first goal by a forward for KC since Dwyer scored against Houston in the Eastern Conference semifinals. After the goal, the Earthquakes picked up the pressure a little bit, but struggled to create really good chances. They should have gotten level though in the 71st minute. After a cross into the box, the ball got headed back across the box to wear Chris Wondolowski was running in unmarked. But from just inside the 18, Wondolowski fired wide of Eric Kronberg's goal to keep it 1-0. The Quakes continued to pressure and Wondolowski again had a chance from a free kick in the 83rd, but fired his effort over the bar. KC withstood San Jose's pressure and picked up their first win of the season, 1-0. Wizards Man of the Match - Benny Feilhaber - The man was all over the place tonight. He looked like a guy tonight (and has all season) that is trying to play his way onto the plane to Brazil for the World Cup. So far in my opinion he's doing a good job of it as he put in another complete performance. Player Ratings - Kronberg 6, Ellis 6, Collin 6, Opara 6, Sinovic 6, Olum 5, Nagamura 5, Feilhaber 8, Zusi 6, Dwyer 6, Zizzo 6. Subs Sapong 6. With KC's departure from the CONCACAF Champions League, Sporting KC turn their full focus to the MLS season and Saturday's opponent, San Jose. The Earthquakes like Sporting bowed out of the competition, falling on penalty kicks to Toluca. San Jose, like Sporting has had a full schedule early in the season. While they were off the first weekend of the season, they'll be playing their 4th game in 12 days, while KC plays it's 5th in 15 days. The Earthquakes rested a few of their regular starters, including center back, Victor Bernardez. The question may be who starts up top for the Quakes. All three of their main forwards, Chris Wondolowski, Alan Gordon, and Steven Lenhart, all played a role in Wednesday night's game and Wondolowski is coming off an injury. So the forward line for San Jose tomorrow could be interesting. Sporting has their own team selection issues to deal with tomorrow after the trip to Mexico City. So far Matt Besler, Benny Feilhaber, and Eric Kronberg have started every game, with Besler and Kronberg playing every minute. Resting any of them wouldn't be a surprise heading into the game tomorrow. A few names that should be expected to play though are Aurelien Collin and Seth Sinovic, who both did not play in Mexico City. Another question though is the health of Chance Myers, who is still listed as quesitonable, if he can't go, that leaves Kevin Ellis who went 90 minutes in Mexico City and Mechack Jerome who went 47 and started last weekend against Dallas as well. That could make for some very tired legs on the right hand side of KC's defense tomorrow. But there could be another debut for KC tomorrow as Antonio Dovale's ITC card has arrived and he's available for selection now as well. Key Match Up - Aurelien Collin vs Steven Lenhart - This is a match up that a few years ago was a heavy weight fight at Sporting Park. It was fun to watch. I'm not sure Lenhart starts tomorrow after starting on Wednesday for the Earthquakes, but if he gets on the field, this match up should be just as fun to watch again. Number to Remember - 8 - That's the number of straight home games in all competitions KC has gone without a loss against the Earthquakes. The last loss was August 14, 2004, which is the last time that either of these two teams have won away from home in this series. PREDICTION - With both teams heading into KC on the backs of grueling games in Mexico at elevation, it doesn't bode well for tomorrow to be an exhibition for the "beautiful game." This game is likely to be a slow, plodding game as both teams are finishing up a very busy stretch of their season. This game is going to be decided by one goal if there's a goal at all. KC's first draft pick from the 2014 Superdraft is no longer with the team. While the team never made an official announcement, Adnan Gabeljic is no longer with KC. The forward from St. Louis has moved on and is now on trial with the Montreal Impact according to the Impact's Twitter account. One has to assume that Peter Schmetz other draft pick that hasn't been signed or released yet is also gone. In other news, two former players have new teams, Scott Angevine has signed for Sporting Kristina in the Finnish third division according to his Twitter and Khari Stephenson has rejoined the San Jose Earthquakes. Here's the rest of this week's update. Teal Bunbury - New England - Started and played 90 minutes in New England's 1-0 loss to Philadelphia. Bobby Convey - New York - Started and played 67 minutes in New York's 1-1 draw with Colorado. Luis Gil - Salt Lake - Started and played 90 minutes, recording an assist in Salt Lake's 3-3 draw with San Jose. Michael Harrington - Portland - Started and played 90 minutes in Portland's 1-1 draw with Chicago. Jack Jewsbury - Portland - Started and played 90 minutes in Portland's 1-1 draw with Chicago. Eddie Johnson - DC - No game this week. Chris Konopka - Toronto - Did not dress in Toronto's 2-1 win over Seattle. Rauwshan McKenzie - Portland - Dressed but did not play in Portland's 1-1 draw with Chicago. Khari Stephenson - San Jose - Came off the bench and played 23 minutes in San Jose's 3-3 draw with Salt Lake. Started and played 102 minutes in San Jose's 1-1 draw that they lost 5-4 on PKs. Christian Duke - Oklahoma City (Loan) - Offseason. Jon Kempin - Oklahoma City (Loan) - Offseason. Mikey Lopez - Orlando (Loan) - Offseason. Pat Healey - Baltimore - Played in all three games for Baltimore as they lost two games to one to Missouri. Korede Aiyegbusi - Servette FC - Switzerland - Did not dress in Servette's 2-0 loss to Lugano. Vicente Arze - FK Hoverla Uzhhorod - Ukraine - Did not dress in Hoverla's 1-1 draw with Metalist. Federico Bessone - Millwall - England - Did not dress in Millwall's 0-0 ddraw with Charlton. Omar Bravo - Chivas - Mexico - Did not dress in Chivas' 1-0 win over Leon. Mitchell Cardenas - Atlético Coatzacoalcos - Mexico - Dres 2-2 with Irapuato. Sunil Chhetri - Bengaluru - India - Started and played 90 minutes, scoring a goal in Bengaluru's 3-1 win over United. Eloy Colombano - UAI Urquiza - Argentina - Did not play in UAI's 4-0 los to Deportivo Merlo. Daneil Cyrus - W Connection - Trinidad - Started and played 90 minutes in W Connection's 3-0 loss to Central. Started and played 90 minutes in W Connection's 4-0 win over San Juan Jabloteh. Pablo Escobar - Cúcuta Deportivo - Colombia - Did not dress in Deportivo's 1-0 win over Barranquilla. Herculez Gomez - Tijuana - Mexico - Started and played 64 minutes in Tijuana's 2-1 loss to Cruz Azul. Came off the bench and played 1 minute in Tijuana's 4-2 win over the Galaxy. Jeferson - Boavista - Brazil - Started and played 90 minutes, scoring 2 goals in Boavista's 2-1 win over Botafogo. Will John - AZAL - Azerbaijan - Started and played 90 minutes, scoring a goal in Azal's 2-1 loss to Neftci. Kei Kamara - Middlesbrough - England - Did not dress in Middlesbrough's 0-0 draw with Bournemouth. Igor Kostrov - FC Costuleni - Moldova - Started and played 90 minutes in Costuleni's 2-0 loss to Milsami-Ursidos. Carlos Marinelli - Universidad San Martin - Peru - Did not dress in San Martin's 1-1 draw with Universitario. Neven Markovic - Servette FC - Switzerland - Started and played 90 minutes in Servette's 2-0 loss to Lugano. Yura Movsisyan - Spartak Moscow - Russia - Started and played 87 minutes, recording an assist in Spartak's 2-2 draw with Anzhi. Michal Mravec - Podbeskidzie - Poland - Did not dress in Podbeskidzie's 2-1 loss to Lech Poznan. Pablo Punyed - Stjarnan - Iceland - Did not play in Stjarnan's 1-0 win over IBV. Yann Songo'o - Ross County (Blackburn) - Scotland (England) -Started and played 90 minutes in Ross County's 1-0 win over St. Johnstone. Milos Stojcev - FK Sarajevo - Bosnia - Started and played 76 minutes in Sarajevo's 2-0 win over Mladost Velika Obarska. Matt Taylor - Preußen Münster - Germany - Came off the bench and played 3 minutes in Munster's 2-0 win over Heidenheim. Ivan Trujillo - Deportivo Lara - Venezuela - Came off the bench and played 13 minutes in Lara's 0-0 draw with Llaneros de Guanare. Graham Zusi picked up his 41st assist in all competitions, breaking his tie with Davy Arnaud for 3rd all time on that list. Zusi made his 148th appearance in all competitions, breaking his tie with Diego Gutierrez for 15th on the all time list. Zusi started his 114th game in all competitions for KC, breaking his tie with Sean Bowers for 18th place on that list. KC headed into Estadio Azul with a 1-0 aggregate advantage against Cruz Azul, but were taken apart tonight by a much better Mexican team. Sporting held the lead heading into the break but were thoroughly embarrassed in the second half as they bowed out of the Champion's League. KC suffered from the Galaxy's defensive disease at the beginning of the game as Joao Rojas cut inside on Josh Gardner, played the ball into the box to Mariano Pavone who turned Kevin Ellis and fired past Eric Kronberg. In the sixth minute, KC should probably have equalized. A cross field ball towards Jacob Peterson was deflected by a Cruz Azul defender but right into the path of Peterson who raced in alone on goal. He fired a shot, but it was right at Jesus Corona who made the save. Cruz Azul continued to pressure and Marco Fabian was incorrectly ruled offside after getting behind Ellis. In the 23rd minute though there was no offside call to rescue KC as Fabian timed his run very well and got behind Ellis. He dribbled into the box and fired a shot that Kronberg got down and saved, but gave upu a rebound right into the middle where Pavone knocked the ball home to make it 2-0 on the night and 2-1 on aggregate in favor of the Mexican side. Cruz Azul continued to pressure and a free header on a corner could have made it 3-0, but it was right at Kronberg who held the ball. KC started to get a little of the ball as the game continued on and in the 43rd won a corner. Graham Zusi played the ball short to Benny Feilhaber who cut inside his defender and then fired a shot that beat Corona to the near post and gave KC the lead on the away goal rule. Cruz Azul came out in the second half and continued to pressure the game, with the game at altitude it was only a matter of time before tired legs started to take over for KC. In the 55th minute Cruz Azul hit again. Again it was Fabian setting the play up, racing by first half sub Mechack Jerome and squaring into the middle for Pavone who one timed a shot past Kronberg as Ike Opara fell down to make it 3-1 on the night. The pressure continued, especially down KC's right wing as Fabian had his way with Jerome. In the 66th minute Cruz Azul put the game to bed as Fabian again burned Jerome down the line. He cut inside along the end line and as Kronberg came out to commit he laid the ball back. The initial effort was blocked on the line by Matt Besler, but Mauro Formica got the rebound and fired home to make it 4-1 on the night. And four minute later the route was on as Cruz Azul combined well in the midfield leading to Christian Gimenez getting behind KC's defense and firing in a shot off the far post to make it 5-1. KC looked gassed while Cruz Azul looked fresh and had a couple opportunities to make the scoreline worse. In the end, the referee called the game basically right at 90 minutes and KC bowed out of the competition rather embarrassingly. Cruz Azul killed KC down the flanks all night and the altitude finally got to him. It's not a bad thing to lose to a team like Cruz Azul, who has to be considered the favorites for the tournament, it's how KC ended up losing that's embarrassing. This game will end up in the same breath as the 7-0 loss to Chicago on July 4th, 2001, or the 6-1 loss at Morelia in the 2002 CONCACAF Champions Cup, or the 6-0 loss to Dallas in Curt Onalfo's last match in charge of the club. Wizards Man of the Match - Benny Feilhaber - Cause he scored the goal, the lone bright spot. Sporting KC continues it's busy start to the season with a trip south of the border to Mexico City where tomorrow they'll take on Cruz Azul. Sporting KC travel to the capital with a 1-0 lead on aggregate thanks to the Kevin Ellis goal last week. This time though KC travel into a hostile environment at altitude looking to advance to the CCL semifinals. Cruz Azul is heading into the game with a couple holes to fill due to suspensions. In the midfield they will be without Alejandro Castro and in defense they'll be short Rogelio Chavez. Both of whom picked up yellow cards in Kansas City and are suspended for this game. Castro's midfield role may be the bigger one to fill for the Machine with their depth. But they'll still have their first team attack for the most part which will cause KC a number of problems. In league play this weekend, Cruz Azul picked up a 2-1 win at home over fellow quarterfinalist, Tijuana. Kansas City comes in on the back of their 1-1 draw with Dallas at home, allowing the late equalizer. From following Twitter tonight, Sporting has traveled with the majority of their first team, which is really what I think everyone expected. The one exception to that is Seth Sinovic who is suspended for the game due to yellow card accumulation. KC does get Aurelien Collin back from suspension though to slot into central defense with Matt Besler. The question for KC is whether Peter Vermes will alter his strategy at all with the game at altitude, KC looked extremely tired by the end of the home leg. They'll need to hold a little bit back or else they'll burn out earlier at altitude. Key Match Up - Aurelien Collin vs Mariano Pavone - Pavone is going to see a lot of the ball tomorrow. It will likely require a strong effort from Collin to contain the Argentine. Number to Remember - 0 - That's the number of home and away series that MLS has won against Mexican sides when the second leg has been in Mexico. Only twice have MLS teams won a home and away series against a Mexican side, and both of those saw the MLS side advance with the second leg at the MLS' home stadium. PREDICTION - This is no easy task at all for Kansas City heading into Mexico City. They have a strong team and have so far sacrificed some league form to put their best foot forward in the CCL. The question is whether that is going to be enough against a very good Cruz Azul side. I want to say that it will be, but I'm not so sure. My feeling is that Cruz Azul is going to score one goal in the first half and another goal in the early second half. The last 10 minutes will be hectic as Sporting looks for the one goal that will see them go through, but it doesn't come and KC bows out. The Missouri Comets have been champions for barely 24 hours, but it looks right now that they won't be defending their title in 2014-2015. At least not in the MISL. Stories out today have the Missouri Comets leaving the MISL, potentially joining the PASL for the next season. There'd been some rumors of some unrest among teams over the past few weeks, but nothing really newsworthy had come out, until today. The team hadn't even left Baltimore this morning before the USL/MISL dropped the first news of the day, releasing a statement about changes that were upcoming. The league stated that they have started to review "all aspects of the property(MISL)." As a result of this and the expected changes coming with it, the league said this: "several teams that possess a different philosophy on how to structure and operate an indoor professional soccer league will not be returning to the MISL." Speculation as to who the teams were started, the Rochester Lancers' owner, Sam Fantauzzo, confirmed that they were one of the four teams. Shortly later, The Post-Standard in Syracuse confirmed the other three teams, Syracuse, Baltimore, and Missouri. The four teams had all fulfilled their three season franchise commitment to the MISL making them free to leave the league if they wanted to. Those four teams leaving would leave the MISL with just three teams, Milwaukee, St. Louis, and Pennsylvania, not enough for them to field a league, which would open those teams up to leave as well. In response to the news, Milwaukee released a statement that they would be "exploring all options in an attempt to keep Professional Indoor Soccer alive in Milwaukee." St. Louis as well is looking at their options if the four teams do leave, saying they won't play in a three team league. Meanwhile, Pennsylvania has had no comment after their one win season and them being around next year in any form would be surprising. A move to the PASL would be an interesting one for the Comets. They'd likely move into the league's Central Division where they'd have trips to Wichita, Dallas, and Tulsa. Would be some closer travel than their trips to the East Coast. Certainly a situation for fans of indoor soccer to keep an eye on. The sport has been struggling to keep a consistent footing since the heydays of the original MISL. Since then there's been a number of other leagues, the NPSL, the XSL, and even another incarnation of the MISL. Getting consistency has been something indoor soccer has lacked. Sporting KC today announced the third player going on loan to their USL affiliates this year. The team had already announced that Christian Duke and Jon Kempin were heading to Oklahoma City to join the Energy. Today the team announced that Generation Adidas midfielder, Mikey Lopez is headed to Orlando City to join the Lions for their 2014 USL-Pro season. The original plan was that Sporting would send to players to both Oklahoma City and Orlando, but at least at this time it looks like it'll just be the three. Maybe once KC is out off the CCL they'll seed down someone else down. The loan for Lopez though is a good opportunity. At this point, Lopez needs to get games and this should give him that opportunity to get time. Hopefully he impresses. First it was Sporting KC in December, now it's the Missouri Comets turn. The Comets scored two goals in the last minute and 34 seconds of the deciding game 3 mini-game to clinch their first MISL title 6-4 over the defending champion Baltimore Blast. First, the less said about game two, the better. The Blast scored 15 unanswered points before Leo Gibson got the Comets on the board in the third quarter. Brian Harris scored another goal for the Comets, but they fell 19-4 to force the mini-game. In the mini-game the Blast got the first goal with under half the quarter left thanks to Max Ferdinand. Less than a minute later the Comets were level through Lucas Rodriguez who scored off a bicycle kick to level the scores at 2-2. The Blast continued to look for a goal to retake the lead and got it through Adauto Neto who tucked it into the corner to make it 4-2. The Comets brought on Vahid Assadpour in the sixth attacker role hoping to find an equalizer. With just over a minute and a half left they got it. A restart in the corner was played back into the path of Rodriguez. The Argentine fired the ball to the back post where Stefan St. Louis reached in front of his mark and knocked the ball home with his shin to level the game at 4-4. Thirty seconds later the Comets got themselves their first lead of the night through Harris. The ball was played up field to Gibson who held off his defender and he touched it wide to Harris who was making an unmarked run up the field. Harris curled his shot first time into the far corner to give the Comets the 6-4 lead. The Comets held off the Blast late as they looked to equalize through the sixth attacker and got their first championship. Harris was named the MVP of the championship series. A deserved award for the defender who had a fantastic season. The Comets return to KC tomorrow, and there will be fan celebration at some time that the team will announce on social media. KC is really trying to live up to that Soccer Capital of America thing. At 20 years and 37 days, Jimmy Medranda became the 5th youngest player to start a league game for KC. He knocked Justin Detter out of the top 20. In all competitions he became the 6th youngest player to start a game for KC, knocking Matt McKeon off that list. Seth Sinovic made his 100th league start of his MLS career. Aurelien Collin scored his 15th goal in all competitions for KC, tying him with Jose Burciaga, Sasha Victorine, Claudio Lopez, and Jack Jewsbury for 20th on that list. Alex Martinez made his Sporting KC debut. Oriol Rosell made his 50th appearance in all competitions for KC. Matt Besler made his 128th league appearance for KC, tying him with Jimmy Nielsen for 12th place all time on that list. For the second straight league game Sporting KC allowed points to slip away. This time instead just one point, KC dropped two as they allowed Dallas to score a goal in the 90th minute to allow them to secure a point with their only shot on goal all game. KC had a good opportunity early on from their high pressure. In just the fourth minute a long ball over the top found Sal Zizzo on the wing. Dallas goalkeeper, Chris Seitz came off his line but got stranded as Zizzo chipped the ball over him. The ball was going wide but CJ Sapong raced in at the far post to try to knock it home but his shot was blocked out for a corner. KC continued the high pressure and in the 12th minute Zizzo had another opportunity. KC forced a turn over in Dallas' end. Sapong ended up with the ball and played it to Benny Feilhaber who dribbled towards the box before dishing off to Dom Dwyer. The ball got poked away from Dwyer right into the path of Zizzo. To lose his man, Zizzo turned and then fired a shot that Seitz pushed away. In first half stoppage time Dallas had their first good look at goal as Blas Perez got the ball at the top of the box, but fired his effort just wide. KC inserted Jacob Peterson into the lineup to start the second half and he caused issues for Dallas down the left. He had a penalty shout in the 52nd minute as he nutmeged Keyln Accosta and dribbled into the box, he appeared to be grabbed a bit by Accosta as he entered the box. Andrew Jacobson got a touch to the ball knocking it away from Peterson, but he caught back up with it at the same time as Accosta and both went down. Originally it appeared that replacement referee Abbey Okulaja pointed to the spot, but he was actually calling the foul on Peterson. KC kept pushing the game and finally found their goal in the 81st minute. Off a Benny Feilhaber corner, Aurelien Collin got space in the box and headed the ball past Seitz and into the net to make it 1-0. After the goal, Dallas became the aggressors pushing the game. Then in the 88th minute, David Texeira went down about 25 yards from goal under little contact from Oriol Rosell. Whether Texeira was fouled or made a meal of it, Michel stepped up and played a nice ball into the box where Matt Hedges met it, heading it past Eric Kronberg and into the net. It was the fifth time in four games against FC Dallas that KC has allowed a goal in the 88th minute or later. The big question that has to be asked about the play is why KC's best header of the ball, Collin, was set up in the wall. I understand that Michel is a good free kick taker, but it makes no sense for Collin to be in the wall there. With the game level, KC threw numbers forward trying to find another goal. They almost got one in the second minute of stoppage time off a free kick. The ball was played quick to Alex Martinez down the line. He raced into the box and fired a shot on goal that beat Seitz, but was knocked away by Hedges to keep the game level. Another game that will frustrate KC fans. Wizards Man of the Match - Aurelien Collin - Another goal for the Frenchman, he's scored four of KC's last nine goals in all competitions. Did a good job shutting down Dallas' attacks, only question was why he was in the wall on Dallas' goal. Player Ratings - Kronberg 6, Jerome 5, Collin 6, Besler 5, Sinovic 6, Rosell 5, Feilhaber 6, Medranda 5, Zizzo 5, Dwyer 4, Sapong 4. Subs Peterson 6, Martinez 6, Bieler 5. The Missouri Comets start off the 2014 Major Indoor Soccer League (MISL) Championship Series with a thrilling 15-8 win over the Baltimore Blast. Missouri’s Vahid Assadpour set a MISL playoff record with a hat trick consisting of only 3-point goals and led all scorers on the night. J. T. Noone had a hat trick of his own for the Blast, scoring two goals late in the game. A crowd of 4,524 were on hand to see the Comets take a 1-0 series lead. Baltimore started the game off with two goals from Noone and Max Ferdinand worth two points each. The Blast would routinely take an early lead like this in the regular season and rely on their stout defense to bring home the win. Tonight, the Comets were not intimidated and kept up their attack. Assadpour answered the Blast’s scores with his first three-point goal of the night. With seven minutes remaining in the first quarter John Sosa found a waiting Assadpour outside the yellow line and without hesitation, the captain buried a shot past Baltimore’s goalkeeper, Troy Hernandez. The second quarter would not see a score change, but the players kept the fans on the edge of their seats as the intensity level rose on the field. As the teams headed off the field, Baltimore holding a slim 4-3 lead, several players were involved in a skirmish towards the player tunnel. After everything was sorted out, Missouri’s John Sosa and Baltimore’s Adriano Dos Santos were each shown a Red Card and ejected from the game. Fired up coming out of the break, Assadpour netted his second three-point goal on a restart play. Not even a minute later, Stefan St. Louis collected a distribution from goalkeeper Danny Waltman and blasted home a shot from just outside the arc. The goal was St. Louis’ second and Waltman’s first assist of the playoff season. With a 9-4 advantage, Comets head coach Vlatko Andonovski encouraged his team to keep up their offensive pressure. Assadpour finished his hat trick five minutes in to the final quarter, unassisted, with a shot that Hernandez never even saw. With this strike, Assadpour set an MISL Record for three-point scores in a playoff game that had held since the 2012 playoff season. The Blast brought Mike Lookingland on as a sixth attacker with minutes left in the game, down 12-4. Lucas Rodriguez cleared a pass out of Missouri’s defensive zone where defender Brian Harris ran onto it. Smartly, he tapped the ball towards goal outside of the three-point arc and walked the ball into the net for the Comets fifth straight three-point score. Noone scored two more times before the final whistle for the Blast, both worth two points, but it was too little and too late for Baltimore. The Comets were able to take a 1-0 series lead on the back of five three-point scores, and a 15-8 victory. The series now moves to Baltimore on Sunday, March 16 at 4:05 p.m. CT. A win would claim the first MISL Championship in Comets history. Should the Blast win Game Two, an immediate 15 minute Mini-Game would be played to decide the winner of the series. Fans are encouraged to join the Comets Nation Fan Club at Coach’s Bar & Grille on 103rd and Wornall on Sunday for the Official Watch Party. The game will be shown LIVE on the Comets website at CometsIndoorSoccer.com/Live-Feed. Sporting KC continue their busy start to the 2014 season tomorrow in their MLS home opener against FC Dallas. KC is coming into the game after an intense, hard fought game against Cruz Azul. They must now find a way to get up for this game before traveling to Mexico City for the second leg. Dallas comes into the game after topping the Montreal Impact 3-2 last weekend at home. Fabian Castillo, Blas Perez, and Mauro Diaz all found net for Dallas in the win. Dallas has a bit of a new look this year after bringing back Oscar Pareja from Colorado, they've added new forwards including Andres Escobar and David Texeira, both of whom did not play a role in the win over the Impact. Both could play a part in the game this coming weekend. They'll also have more bit in their midfield with the addition of Hendry Thomas, also from Colorado. For Kansas City, there's a question of how exactly they'll come out for the game tomorrow. They will likely rest a few players ahead of the trip to higher altitude for the game against Cruz Azul. Matt Besler, Kevin Ellis, and Graham Zusi have played every minute of the first two games, and Benny Feilhaber isn't that far behind. Getting a few of those guys a rest would not be surprising ahead of this game and the Champions' League game. A healthy Chance Myers can slot back in at right back, and if not him, then Mechack Jerome can step in. With Aurelien Collin sitting out Wednesday and Seth Sinovic suspended this coming Wednesday I'd expect them both to start tomorrow. There could also be room for the likes of Jimmy Medranda or Mikey Lopez to make their first MLS start. This really is one of the harder games to figure out exactly how Kansas City is going to come out, which could work to their advantage. Key Match Up - KC Defense vs Dallas Offense - With KC likely fielding at least a couple reserves tomorrow KC is going to need someone to step up defensively the way that Ellis did against Cruz Azul. Dallas has a lot of attacking options that could cause a lot of trouble for a tired KC back line. Number to Remember - 2 - That's the number of losses that KC have in home openers in MLS history. Sporting is 11-2-5 in their first home game. They have not lost since a 3-2 loss to Toronto in 2009. PREDICTION - A lot of fans already appear to be looking past this game and on towards Wednesday's match against Cruz Azul. But a loss here and KC does something that has only happened twice in their history, go winless in their first two games. Dallas is an improved team from last year and should provide a big challenge for KC. And while a loss isn't crippling, since it's against a Western Conference foe, dropping to 0-2 would be a bit of a confidence blow heading into the match up with Cruz Azul. Sporting Kansas City today announced the first of their loan moves to their USL-Pro affiliates for the 2014 season. The first moves were for their affiliate in Oklahoma City, the Energy. The two players loaned to the Energy, Christian Duke and Jon Kempin are headed out for their second loan spells. Both Duke and Kempin spent the 2013 season with Orlando City. The fact that both are going out on loan is not a surprise. Kempin going to Oklahoma City is probably the least surprising move as it allows him to continue to learn from Jimmy Nielsen, who mentored Kempin many times while he was still with Kansas City. Duke showed a lot of improvement during his time with Orlando City, but he still isn't quite ready to contribute in KC's midfield. We're still awaiting word on who will be heading to Orlando this year. One possibility, especially with the emergence the past two games of Kevin Ellis, is Mechack Jerome, who played with Orlando before being brought in by KC last year. Other possibilities include Alex Martinez, Soony Saad, or even Erik Palmer-Brown. Sporting KC still has one open spot on their roster currently after the signing earlier this week of Antonio Dovale. Today came a rumor out of Brazil that KC will be filling that spot with a player they faced in preseason. Rumor is that KC is set to secure a loan deal for Fluminense's right back, Igor Julião. Sporting got to see Julião up close and personal in Orlando during preseason as he started at right back for Fluminense's U23 team in their 3-0 loss to KC at the Disney Pro Soccer Classic. While Julião is listed as a right back, he cane apparently also play in the midfield and on the wing, similar to the recently signed Dovale. Julião has a couple of appearances for Fluminense's first team and has also appeared for Brazil's U20 team. On paper this type of deal reminds me of the deal that brought Jimmy Medranda to Kansas City. The then 19 year old Medranda didn't get much playing time while on loan last year (just 1 appearance), but impressed enough for KC to agree buy him. I'd see something similar if Julião impresses. Last year after moving to Wigan from Kansas City during the winter transfer window, Roger Espinoza helped Wigan Athletic beat Manchester City in the FA Cup final to win back to back cups. This year in the FA Cup quarterfinals Wigan was matched up against City again. The result didn't change, Wigan took out their fellow finalist 2-1 at the Etihad Stadium with Espinoza playing the final 24 minutes for Wigan. Here is the rest of this week's update, including the return of MLS play. Davy Arnaud - DC - Started and played 73 minutes in DC's 3-0 loss to Columbus. Teal Bunbury - New England - Started and played 90 minutes in New England's 4-0 loss to Houston. Bobby Convey - New York - Started and played 90 minutes in New York's 4-1 loss to Vancouver. Luis Gil - Salt Lake - Started and played 66 minutes in RSL's 1-0 win over LA. Michael Harrington - Portland - Started and played 90 minutes in Portland's 1-1 draw with Philadelphia. Jack Jewsbury - Portland - Started and played 85 minutes in Portland's 1-1 draw with Philadelphia. Eddie Johnson - DC - Started and played 90 minutes in DC's 3-0 loss to Columbus. Rauwshan McKenzie - Portland - Did not dress in Portland's 1-1 draw with Philadelphia. Khari Stephenson - San Jose - Did not dress in San Jose's 1-1 draw with Toluca. Tyson Wahl - Columbus - Came off the bench and played 1 minute in Columbus' 3-0 win over DC. Pat Healey - Baltimore - Played in both of the Blast's games against Syracuse. Korede Aiyegbusi - Servette FC - Switzerland - Started and played 90 minutes in Servette's 1-0 win over Locarno. Federico Bessone - Millwall - England - Did not dress in Millwall's 1-0 win over Derby. Started and played 64 minutes in Millwall's 1-0 loss to Blackpool. Omar Bravo - Chivas - Mexico - Did not dress in either of Chivas' games. Mitchell Cardenas - Atlético Coatzacoalcos - Mexico - Lost 1-0 to EAEM Potros. Sunil Chhetri - Bengaluru - India - Started and played 90 minutes, scoring two goals in Bengaluru's 3-0 win over Churchill Brothers. Eloy Colombano - UAI Urquiza - Argentina - Started and played 75 minutes in UAI's 1-0 loss to Almagro. Did not play in UAI's 0-0 draw with Chacarita Juniors. Daneil Cyrus - W Connection - Trinidad - Started and played 90 minutes in W Connection's 2-0 win over St. Ann's. Pablo Escobar - Cúcuta Deportivo - Colombia - Did not play in Deportivo's 2-0 win over Real Santander. Roger Espinoza - Wigan - England - Came off the bench and played 24 minutes in Wigan's 2-1 win over Manchester City in the FA Cup. Did not dress in Wigan's 1-0 win over Sheffield Wednesday. Herculez Gomez - Tijuana - Mexico - Came off the bench and played 15 minutes in Tijuana's 2-0 win over Chivas. Came off the bench and played 10 minutes in Tijuana's 1-0 loss to LA. Jeferson - Boavista - Brazil - Started and played 70 minutes in Boavista's 0-0 draw with Macae. Started and played 63 minutes in Boavista's 1-0 win over Volta Redonda. Will John - AZAL - Azerbaijan - Started and played 90 minutes in Azal's 2-0 loss to Simurq. Kei Kamara - Middlesbrough - England - Came off the bench and played 18 minutes in Middlesbrough's 2-0 win over Ipswich. Came off the bench and played 7 minutes in Middlesbrough's 1-1 draw with Nottingham Forest. Igor Kostrov - FC Costuleni - Moldova - Started and played 90 minutes in Costuleni's 0-0 draw with Academia. Started and played 78 minutes in Costuleni's 1-1 draw with Veris. Carlos Marinelli - Universidad San Martin - Peru - Started and played 89 minutes, picking up a red card in San Martin's 1-0 win over Sport Huancayo. Neven Markovic - Servette FC - Switzerland - Started and played 90 minutes in Servette's 1-0 win over Locarno. Yura Movsisyan - Spartak Moscow - Russia - Came off the bench and played 49 minutes in Spartak's 1-0 loss to Terek Grozny. Started and played 71 minutes in Spartak's 1-0 extra time cup loss to Tosno. Michal Mravec - Podbeskidzie - Poland - Did not dress in Podbeskidzie's 0-0 draw with Piast Gliwice. Milos Stojcev - FK Sarajevo - Bosnia - Started and played 90 minutes in Sarjevo's 1-1 draw with Olimpic Sarajevo. Started and played 79 minutes in Sarajevo's 1-1 draw with Zeljeznicar in the cup. Matt Taylor - Preußen Münster - Germany - Started and played 67 minutes in Munster's 2-1 win over Unterhaching. Ivan Trujillo - Deportivo Lara - Venezuela - Did not play in Lara's 3-1 win over Atletico Venezuela. Kevin Ellis scored his first professional goal. Ellis' goal was KC's 25th in international competition. At 22 years, 255 days, Ellis is the 18th youngest goal scorer in all competitions in KC's history. In the 50th minute, Matt Besler moved past Michael Harrington and into 11th place for minutes played in all competitions. He finished the game with 13,317 minutes played. Graham Zusi made his 147th appearance in all competitions for KC, tying him with Diego Gutierrez for 15th place. Zusi made his 113th start in all competitions for KC, tying him with Sean Bowers for 18th place on that list. The shutout was Eric Kronberg's 10th of his career, tying him with Mike Ammann for 5th all time. Sporting KC return home and return to the CONCACAF Champions League for their first game in the quarterfinals against Mexican side Cruz Azul. The home and away series will see KC head to Mexico next Wednesday for the second leg. Sporting will look to head to Mexico with a couple goal advantage in their hopes of advancing. While a win as a whole would be nice, going to Mexico with a multi-goal advantage would be huge for KC. Cruz Azul comes into CCL play on the back of their first loss of the Mexican Clausura season, 3-0 to Tigres, a shocking result considering their standing in the league table. Up to that point, Cruz Azul had been 8-0-1 in league play, scoring 18 while allowing just 3. The loss may serve as the wake up call to keep Cruz Azul from coming into this game complacent, especially since the loss occurred with a majority of their starters on the field. I expect that they've traveled with a majority of their first team for this game as well. Sporting on the other hand rested a few players ahead of this game, or at least that's the assumption. Paulo Nagamura, Chance Myers, and Seth Sinovic all sat out KC's game against Seattle with injuries. The reports out today have Myers and Sinovic both as doubts for tomorrows games. Combine that with Aurelien Collin being suspended for yellow card accumulation and KC could be without three quarters of their best back four with only captain Matt Besler remaining. Personally I feel like the Myers and Sinovic injuries are some gamesmanship by Vermes and I expect one or both to start against the Mexican side. And as for replacing Collin, Ike Opara filled in quite well throughout the 2013 season. Overall though I think we'll see KC throw out the best they can for this game. Number to Remember -2 - That's the number of home and away series that MLS teams have won against Mexican teams in the CONCACAF Champions' League and it's predecessor, the Champions' Cup. The KC Wizards topped Santos Laguna 3-2 on aggregate in 2002, while Seattle topped Tigres by the same 3-2 aggregate scoreline. The other side of that though is both of those series saw the MLS team have the second leg at home, no MLS team has advanced when the Mexican team has had the second leg at home. PREDICTION - If Sporting KC want to advance they need to get a result at home and they need to win by a couple goals. Cruz Azul is just too good of a team to not take advantage of your home field advantage. They'll need to have better finishing at home than they've shown in the past. I'm just not sure that KC can shut down Cruz Azul's offense enough while being able to produce enough offensively themselves to get a result that will make me comfortable in league two. Sporting Kansas City today announced the signing of Spanish midfielder, Toni Rodriguez Dovale. Depending on the arrival of his ITC and P-1 visa he will be added to the roster. He fills the team's fifth of eight international slots. Dovale joins the team from Celta Vigo. Reports yesterday seemed to indicate that the move to KC could be a loan move until December. Those claims appear to be untrue as Sporting's release says that they signed the midfielder, while prior loans have stated the deal was a loan. Another rumor running around ahead of the official signing was Dovale's status on the roster. There were questions about whether he would be a designated player or not. As with the loan situation, no mention is made of the player being a designated player. From reading Peter Vermes' quotes about Dovale, he expects him to play mainly as an attacker to start. For the second year in a row the Missouri Comets beat the Milwaukee Wave in a mini-game to advance to the MISL Championship series. After winning the game on Sunday in Missouri the Comets needed to win one of the two games on the night to advance to the championships. Game two was a back and forth affair that was tight throughout with no team ever leading by more than three points. The Wave took the lead in the first quarter with a two point goal. Brian Harris gave the Comets the lead in the second quarter on a three point goal, but the Wave retook the lead before half time. The third quarter saw the Comets build their largest lead of the game as Leo Gibson and Bryan Perez both scored to make it 7-4. The fourth quarter saw the Wave close the lead before Vahid Assadpour scored to make it 9-6. The Wave though then scored three unanswered goals to win the first game 12-9. The one quarter mini-game started shortly after that. The Comets grabbed the lead in the first 30 seconds when Brian Harris scored to give the Comets a 2-0 lead. six minutes in the Comets doubled the lead, again through Harris. He'd just come on the field and the Wave didn't pick him up until it was took late as he beat Marcel Feenstra 1v1 to give the Comets a 4-0 lead. Just before the 10 minute mark though the Wave found a way back into the game. Stefan Stokic attempted to head the ball back to Danny Waltman but put it too high and off the boards above the goal. The ball ended up falling to Ian Bennett who knocked it across to Giuliano Oliviero who touched the ball home past a diving Waltman to make it 4-2. With just over three minutes left though the Comets sealed the game as captain Vahid Assadpour picked up a ball and dribbled the length of the floor before beating Feenstra to make it 6-2. The Comets held on against the Wave's sixth attacker to book themselves a place in the finals against either Syracuse or Baltimore. While the Comets were the only team to beat the Wave this season, Syracuse and Baltimore are two teams that Comets didn't beat this season, going a combined 0-4 against the two teams. Sporting Kansas City announced an expansion of the Sporting KC Television Network today. The expansion will see Sporting games that are not on national television broadcasted to portions of nine states around the Midwest. KC already had a deal with KCMI (38 the Spot) to broadcast all 23 of KC's games that are not on national television. Joining KCMI in broadcasting all 23 games is WIBW out of Topeka, KMTW in Wichita, Cox Channel in both Oklahoma City and Tulsa, Cox Channel in Omaha, and MyUTV in Sioux Falls, South Dakota (although four of the games will be broadcasted on the same day on tape delay). Then up to 20 games will be broadcasted in parts of Kansas, Missouri, Iowa, Illinois, South Dakota, Minnesota, and Wisconsin on Mediacom (MC22) (5 will air on tape delay in select markets). Finally, KZOU in Columbia will broadcast 16 games. So Sporting KC will be all over the place in the Midwest. Without looking up the other team's contracts I'd guess this gives KC one of, if not the largest media footprints in the league. Compared to just 10 years ago when I remember "watching" a Wizards game at a bar in KC this is fantastic. And by watch I mean follow it live on match tracker after a meeting. The team's attempts to become the regions team with this deal is great, it's similar to the Royals regional radio deal or the Chiefs past where one of their logos even showed them as a regional team. There are a few questions I've seen. The biggest from fans in those areas is how this affects MLS Live or Direct Kick. Whether the black out rules will apply, if fans won't be able to watch the game, having previously purchased the plan, in part, to make sure they would be able to see Sporting to begin with. It looks like KC is on the verge of bringing in another new player based on reports out of Spain. The rumor out of Spain today is that Celta Vigo player Toni Rodriguez is in Kansas City for a medical ahead of signing with the club. Reports the last few weeks have talked about Rodriguez wanting Celta Vigo to tear up the contract the player has with the club so that he can make the move to KC. With him recently signing a new contract that apparently has him under contract to the Spanish club until 2017, it's not surprising that they wouldn't want to do that. Reports are that a deal is being finalized at this time. Today's article makes it sound like the deal for Rodriguez would be a loan through December. At that point the team could decide if they want to keep Rodriguez the same way they ended up keeping Jimmy Medranda after his loan move last year. Combine the articles out of Spain reporting that Rodriguez is in the US with Robb Heineman's Tweet today and you can connect the dots. A player that's been linked with KC is in town while Robb says we're on the verge of a nice new signing. Include the fact that Peter Vermes has said Rodriguez is a guy they've looked at and it's easy to make the guess that Rodriguez is set to be a Sporting KC player. Aurelien Collin made his 100th start in all competitions for KC. He's the 28th player to hit that mark for KC. In the 83rd minute, Zusi moved past Sasha Victorine and into 20th place for minutes played in league play for KC's history. Zusi finished the game with 8,628 minutes played. Zusi also made his 124th league appearance for KC, breaking his tie with Chris Brown for 15th place on that list. Zusi made his 112th start in all competitions, tying him with Myers for 19th on that list. Matt Besler made his 145th start in all competitions for KC, breaking his tie with Josh Wolff for 11th on that list. It's becoming a bad habit for Sporting KC, allowing the Seattle Sounders to get a win on late goals. For the sixth time today Sporting allowed a goal in second half stoppage time that allowed the Sounders to take all three point. This time the goal came from Chad Barrett as he poked a shot home after a scramble in front of goal. Kansas City came out with a few surprises in their lineup, likely with an eye towards Wednesday and a CONCACAF Champions League match up with Cruz Azul. Chance Myers, Seth Sinovic, Paulo Nagamura, Oriol Rosell, and Claudio Bieler were either left on the bench or left in Kansas City replaced by Josh Gardner, Kevin Ellis, Lawrence Olum, Dom Dwyer, and Jacob Peterson. Even with a number of reserves in the lineup KC still was able to bring the game to Seattle. In just the second minute, Graham Zusi forced a save from Seattle's Stefan Frei. The rebound fell into the path of an onrushing Dwyer but Frei recovered well and was able to get enough of Dwyer's shot to push it wide. KC continued to be aggressive in the early going, testing Seattle's back line. Seattle's first really good chance came in the 31st minute when a Marco Pappa shot was deflected, but Eric Kronberg saw the deflection well and pushed it out for a corner. Shortly after that opportunity KC should have grabbed the lead. Off a Kronberg goal kick, the ball was flicked on into the path of Zusi. Zusi played the ball to Dwyer who cut inside his defender and fired a shot on goal. Frei parried the shot away but right into the path of Peterson. The forward though couldn't get over the ball enough on his volley attempt and sent the ball well over the goal. Dwyer had another opportunity a few minutes later after getting played on by CJ Sapong. Dwyer's effort though took a deflection and skipped wide of the far post. The second half saw the Sounders come out and push the game more as the home side. In the 53rd minute, the Sounders almost grabbed the lead. Lamar Neagle received a through ball as Gardner missed on a slide to intercept the pass. Neagle dribbled in on goal and fired a shot that Kronberg got enough of to push off target, but right into the path of Obafemi Martins. Martins though couldn't make enough contact to turn the shot on goal. KC struggled to get out of their own end and the Sounders continued to press. Kenny Cooper fired an effort just wide of Kronberg's far post in the 69th minute. Sporting continued to try to push the game forward but found their opportunities to move forward lacking. Early in stoppage timie they did get an opportunity as Frei missed on collecting a long ball when challenged by Sapong. The ball fell to Dwyer but he ended up having his shot deflected wide of the goal. Then in the 94th minute, Osvaldo Alonso won the ball in the Seattle end of the field and raced forward. He picked out Clint Dempsey who ended up playing the ball wide to Sean Okoli. Okoli crossed the ball into the middle towards Martins, but it didn't get to him, instead Kronberg and Matt Besler collided and the ball went up into the air. the ball fell to Dempsey, whose header clanged off the cross bar. His second attempt at a volley did get enough on it, but it fell to Barrett who knocked the ball home to give the Sounders the lead at the death. Only seconds after the restart the final whistle blew ending the game. Wizards Man of the Match - Benny Feilhaber - Playing a bit deeper than normal, Feilhaber did a good job of breaking up the Sounders' attacks. His absence was noticed especially on the Sounders goal as Alonso ran right through the area that Feilhaber would have likely been filling if he hadn't just been subbed out of the game. Player Ratings - Kronberg 6, Ellis 5, Besler 6, Collin 6, Gardner 5, Olum 5, Feilhaber 6, Zusi 5, Sapong 4, Dwyer 5, Peterson 4. Subs Zizzo 4, Jerome NR, Opara NR. By the time KC takes the field tomorrow in Seattle against the Sounders to start the 2014 MLS season, it will have been just 91 days since Sporting KC lifted the 2013 MLS Cup. They were the last ones off the field in 2013 and will be one of the first teams back on it as they and the Sounders are the first game of the 2014 season. The Sounders made a number of roster changes from last season. They'll have a new starting goalkeeper after parting ways with Michael Gspurning. The likely starter is Stefan Frei who came over from Toronto, but Sigi Schmid has not ruled out starting veteran Marcus Hahnemann. They've also seen changes over the rest of the field too, bringing in long time Columbus Crew defender, Chad Marshall, Chicago Fire defender Jalil Anibaba, and acquired former Fire midfielder Marco Pappa via allocation. On the other hand they've seen the departure of Eddie Johnson to DC. One question for Seattle tomorrow will be what role designated player Clint Dempsey will play. Schmid said the US international will play a role, but he's missed all of preseason while playing with Fulham and traveled from Cyprus where he was with the US team. So him playing isn't a surprise, but it'll be interesting to see how much he plays. While Seattle has made a number of roster changes, Kansas City has done the opposite. Ahead of tomorrow's game KC has only brought in three new players this year, Andy Gruenebaum, Sal Zizzo, and third round draft pick, Alex Martinez. The rest of the roster is returning from last year. That cohesion should play to Kansas City's advantage tomorrow in the opener. But KC also has one eye on Wednesday when Sporting will take on Cruz Azul in the CONCACAF Champions League. With an eye towards that a few first team players could rest ahead of the game. Specifically some of KC's players struggling with early season injuries. Chance Myers, Paulo Nagamura, and Seth Sinovic are all listed as questionable. I doubt that all three of them will play in the game tomorrow. Key Match Up - Dom Dwyer vs Chad Marshall - With Bunbury gone, Dwyer probably has the most speed of any of KC's forwards. I think Peter Vermes goes with that little extra speed against Seattle's back line and saves Claudio Bieler for Wednesday against Cruz Azul. Number to Remember - 1 - That's the number of wins KC has against Seattle since they came into the league. The lone win came in the teams' fist meeting when Davy Arnaud scored from long range as KC won 1-0. Since then it's been all Seattle, including a number of games where they've scored the winner late, including last year at Sporting Park. PREDICTION - It's crazy that the season is already here and that KC is back in action. But the big thing that KC has going for it is the familiarity of the player son the team. While some lineup changes may occur, the majority of the roster knows Vermes' system already and has played at least a year under it and know what to expect. That will be the big thing that helps KC early on this year. Hopefully they can take advantage of it tomorrow on the road. But I think taking a point out of Seattle again is a good expectation.